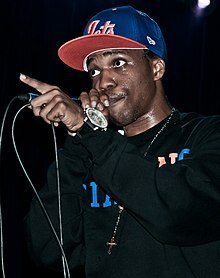 Shante Scott Franklin (born April 4, 1981), better known by his stage name Currensy (stylized as Curren$y) is an American rapper. He was one of the original members of Young Money Entertainment, a label founded by Lil Wayne. In 2011, Franklin founded the label Jet Life Recordings. In 2002, Currensy was signed to Master P's No Limit Records and was a member of the 504 Boyz. The song "Get Back" by 504 Boyz Produced by Donald XL Robertson made it to the Malibu's Most Wanted soundtrack. Currensy appeared on 5 songs in Master P's Good Side, Bad Side album, released in 2004. Even though he was signed with No Limit, he represented C-Murders TRU label. Currensy has several songs with incarcerated friend C-Murder, and was featured on the late Soulja Slim's album, Years Later. Later on, in 2004, Currensy signed with Cash Money Records and Lil Wayne's Young Money Entertainment. He featured in Lil Wayne's Dedication, Dedication 2, The Suffix and several unreleased songs while with Young Money. He released a mixtape entitled Welcome Back in 2004. He was featured in Lil Wayne's "Grown Man" on Tha Carter II. While still at Young Money, Currensy created Fly Society with skateboarder Terry Kennedy, first as a clothing company, then expanding to release music. He released the song, "Where da Cash At" as the lead single for his Young Money debut, Music To Fly To, in 2006, but had to deal with several push-backs and lack of promotion. In 2007, another mixtape was released entitled Life at 30,000 Feet. He remained with Young Money until late 2007. For several months throughout 2008, Currensy released a series of mixtapes. Currensy signed with Amalgam Digital to release his debut album, This Ain't No Mixtape, in 2009. This album was entirely produced by Monsta Beatz. Currensy was also selected to XXL magazine's annual "Freshman Class" list, and released his second album, Jet Files, through Amalgam Digital that same year. Amalgam Digital released physical copies of This Ain't No Mixtape and Jet Files on May 31, 2010. Currensy's third album, Pilot Talk, was released on July 13, 2010. The album featured guest appearances by Snoop Dogg, Big K.R.I.T. and Mos Def, amongst others, with most of the songs produced by Ski Beatz. Prior to the album's release, there was news of Pilot Talk being released under a newly relaunched Roc-A-Fella Records. However, Currensy stated in interviews with both XXL and Complex Magazine that the album would be released under Damon Dash's DD172 record label division, BluRoc Records and distributed through Def Jam Recordings. Currensy made numerous appearances on labelmate Ski Beatz' debut studio album, 24 Hour Karate School, which was released on September 21, 2010. Currensy's fourth album, Pilot Talk II, was released on November 22, 2010, which featured Fiend and Raekwon, among others, with many of the songs produced by Ski Beatz. 2010 also saw the release of mixtape Smokee Robinson with DJ Don Cannon. On February 1, 2011, it was announced that Currensy signed a label deal with Warner Bros. Records for his imprint, Jet Life Recordings. Covert Coup was his first project on his Jet Life Recordings imprint under Warner Bros. Released for free via Currensy's official website on April 20, the album contains ten songs completely produced by The Alchemist. He released a mixtape, Weekend at Burnie's on June 28, 2011, featuring his Jet-Life anthem "#JetsGo", which was produced by Rahki. The rest of the mixtape was produced by frequent collaborator Monsta Beatz. In 2011, Currensy and his Jet Life crew released the album Jet World Order, under Jets International / iHipHop. Every track on this album features Young Roddy and Trademark da Skydiver. Frequent collaborators of Currensy are also featured on this album, including Smoke DZA, The Cool Kids' Mikey Rocks, Cornerboy P, Fiend, Street Wiz, and Nesby Phips. Currensy himself appears on three tracks. On November 10, 2011, Currensy announced through Twitter the release of a new album. Muscle Car Chronicles, a 2-Disc set, was released on February 14, 2012. Currensy also plans on releasing Pilot Talk III in 2013, and mentioned the possibility of it being a free album. In February 2012, Currensy released the EP Here..., and a few days later released another EP #The1st28 with Styles P.
On April 21, 2012 the track listing for The Stoned Immaculate was released. In July 2012, Currensy released the EP featuring all production by Harry Fraud, Cigarette Boats. On October 31, 2012 he released the mixtape Priest Andretti. He will release a new tape with Wiz Khalifa, titled Live in Concert. In November 2012 Currensy gave an update on his and Wiz Khalifa's mixtape Live in Concert saying its release is being held up by sample issues. In January 2013, Currensy said that due to these same legal issues, the mixtape would likely become a retail album. It was released as an iTunes only EP on April 20, 2013. On February 3, 2013, Currensy released his latest mixtape New Jet City with guest appearances from Wiz Khalifa, French Montana, Jadakiss, Juvenile, Juicy J, Trinidad James and Rick Ross among others. On October 30, 2013, Currensy released The Stage EP with Smoke DZA and Harry Fraud. Currensy announced a new mixtape, The Drive In Theatre, in January 2014. He followed up on January 26, 2014, with the release of a new single, "Godfather 4" featuring Action Bronson. On February 4, 2014, Currensy took to Twitter to announce a release date for The Drive In Theatre, it was released on February 14, 2014. On January 17, 2013, Currensy announced on Twitter that he and Ski Beatz began the process of making Pilot Talk III. The album has been in development ever since, with Currensy, in various interviews, naming possible guest appearances from Lil Boosie, Lil Wayne, Wiz Khalifa, Ab-Soul, French Montana, Action Bronson, Jadakiss, Styles P, and Riff Raff, with a majority of the production handled by Ski Beatz, along with some production from Cool & Dre. On January 19, 2015, Currensy posted the album's possible artwork on his Instagram account, created by David Barnett, who was also responsible for the artwork of the first two Pilot Talk albums. On March 1, 2015, DJ Skee released the first single "Alert" featuring Styles P and produced by Ski Beatz. On March 15, 2015, Currensy announced that he'll be releasing Pilot Talk III exclusively on a $100 USB drive, "bundled with a Jet Life shirt and Pilot Talk 3 look book" with accompanying music videos. However, he also hinted at the album may be up for streaming. The bundle was available for pre-order on the Jet Life website, which also confirmed that it will not be released on iTunes. It was set for release on April 4, 2015. He released 12 mixtapes in 2016. On February 1, 2011, Currensy started his imprint Jet Life Recordings. In March 2012, news surfaced of legal action being taken against Damon Dash by Currensy. In the lawsuit, the rapper claimed that he never legally signed to Dash's DD172 label, and the record executive released the pair of albums (Pilot Talk I and Pilot Talk II) as well as Muscle Car Chronicles without authorization. Currensy is demanding that Dash immediately stop releasing his music for profit, and is seeking $1.5 million in damages. On October 6, 2015, Currensy was awarded $3 million in settlement stemming from the 2012 lawsuit against Dash for releasing material of his music without his consent. ^ "504 Boyz - Get Back (CD)". Discogs.com. Retrieved 2015-07-15. ^ "Master P - Good Side, Bad Side (CD, Album)". discogs.com. ^ David D. (2009-05-12). "Review Of Currensy's This Ain't No Mixtape | The Smoking Section". Smokingsection.uproxx.com. Retrieved 2011-02-20. ^ "Sorry, the page you were looking for is not here". The Source. Retrieved 2011-02-20. ^ "Damon Dash Resurrects Roc-A-Fella To Start A 'Positive Movement'". Shaheem Reid. ^ a b "Curren$y's Rocafella Chain Powered By BLUROC". Retrieved September 6, 2010. ^ "Video: Curren$y Pilot Talk 2 Coming November 22nd!". Retrieved October 27, 2010. ^ Vasquez, Andres (2010-09-02). "DX News Bits: Kid Cudi, Queen Latifah, Curren$y | Get The Latest Hip Hop News, Rap News & Hip Hop Album Sales". HipHopDX. Retrieved 2011-02-20. ^ "Curren$y Signs to Warner, Preps EP With The Alchemist | Hip-Hop On A Higher Level". Xxlmag.Com. Retrieved 2011-02-20. ^ "Curren$y and Alchemist Release Free EP". Pitchfork.com. Retrieved 2011-06-20. ^ "Curren$y's New Album: Weekend at Burnie's". Pitchfork.com. Retrieved 2011-06-20. ^ "Curren$y releases 'Stoned Immaculate' Tracklist". DJ Smallz. Retrieved 2012-04-21. ^ "Curren$y "#PriestAndretti" Mixtape Cover Art & Release Date". HipHop DX. Retrieved 27 October 2012. ^ "Curren$y Explains "Live In Concert" Delays, Says "New Jet City" May Be Free". HipHop DX. Retrieved 10 November 2012. ^ "Curren$y Says "Live In Concert" With Wiz Khalifa Will Release At Retail". HipHopDX. 9 January 2013. Retrieved 9 March 2015. ^ Isenberg, Daniel (February 3, 2013). "Mixtape: Curren$y "New Jet City". Complex. Complex Media. Retrieved February 3, 2013. ^ Ellis, Stacy Ann (October 30, 2013). "New Music: Curren$y, Smoke DZA And Harry Fraud 'The Stage' EP". Vibe. Retrieved November 9, 2013. ^ "» Curren$y Announces New Mixtape, 'The Drive In Theatre'". 2DOPEBOYZ. Retrieved 9 March 2015. ^ Rose Lilah. "Curren$y - Godfather 4 Feat. Action Bronson". HotNewHipHop. Retrieved 9 March 2015. ^ "Spitta on Twitter". Twitter. Retrieved 9 March 2015. ^ Andres Tardio. "Curren$y Announces "Pilot Talk III" With Ski Beatz". HipHopDX. Retrieved 15 March 2015. ^ Bruce Smith. "Curren$y Shares Hopes To Feature Lil Boosie On "Pilot Talk 3"". HipHopDX. Retrieved 15 March 2015. ^ Andres Tardio. "Curren$y Discusses Lil Wayne's "Pilot Talk III" Appearance Potential". HipHopDX. Retrieved 15 March 2015. ^ a b Christopher Harris. "Curren$y "Pilot Talk III" Cover Art". HipHopDX. Retrieved 15 March 2015. ^ a b Danielle Harling. "Curren$y Explains "Pilot Talk 3" Delay". HipHopDX. Retrieved 15 March 2015. ^ DJ Skee. "Curren$y - Alert - Listen". Audiomack. Retrieved 15 March 2015. ^ Jay Balfour. "Curren$y To Release "Pilot Talk 3" As $100 USB Drive Bundle". HipHopDX. Retrieved 15 March 2015. ^ "Welcome to JET LIFE APPAREL - Official Merchandise For Curren$y & The Jets". jetlifeapparel.com. ^ Goddard, Kevin (19 November 2016). "Curren$y mixtapes in 2016". Hotnewhiphop. Retrieved 19 November 2016. ^ Diep, Eric (2013-11-12). "Meet MaryGold, Curren$y's Latest Jet Life Signing - XXL". Xxlmag.com. Retrieved 2015-07-15. ^ Y, T (2015-10-08). "Son of A Gangsta Vol.2". jet-life.com. Retrieved 2015-10-08. ^ "Curren$y Files Lawsuit Against Damon Dash For Unauthorized Release Of His Music". BallerStatus.com. 2012-03-25. ^ Hernandez, Victoria (October 6, 2015). "Curren$y & Damon Dash Reach $3 Million Agreement In Lawsuit". HipHopDX. Retrieved October 17, 2015. ^ "Curren$y Announces "Pilot Talk III" With Ski Beatz". HipHopDX. 18 January 2013. Retrieved 9 March 2015. ^ "Wiz Khalifa & Curren$y Announce '2009' Tour: See Dates". Billboard. Retrieved February 13, 2019. This page was last edited on 16 April 2019, at 18:00 (UTC).